It is one kind of resistance welding process. An electric arc is produced between stud and flat surface of the workpiece. The arc melts the end of the stud and the pressure is applied on the stud to fix it on the work metal surface. A special welding gun is used for stud welding which consists of spring, solenoid, trigger, timer etc. The stud is placed in the welding gun. The front end of the gun is held against the work surface. 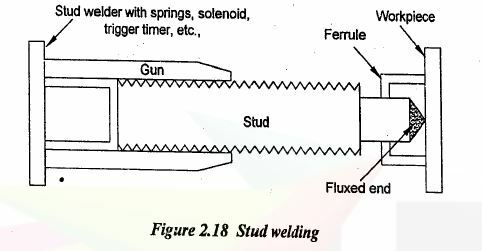 When the trigger of the gun is pressed, welding current flows between end of the stud and work surface. An arc is produced between the gap of the stud and work. It melts the end of the stud. A molten pool is formed on the work surface. Now, the melted end of the stud is pressed on the molten pool of work and it gets welded to the work. The front end of the stud has a flux coated conical surface. The flux protects the welding from atmospheric effects. The ferrule is used to guide and locate the stud to the proper position. The process is automatic and it is used for welding metal studs on bodies without drilling and tapping. The time required for welding is approximately one second. This process is used in mass production. 1. The welded joint is stronger than the parent material or the stud. 2. Deep weld penetration is possible. 3. High speed welding of studs on thin steel sheets is possible. 4. It limits down time. 5. It cuts labour and material cost. 6.It is user friendly and easy to operate. 7.Machine is equipped with effective safety operations for user. 9.Sound welds are readily made with good process design and control. 10. Practically, no edge preparation is necessary. 11. The process is suitable for both indoor and outdoor works. 12. It has very low distortion by extremely short welding time. 13. Welds produced are sound, uniform, ductile, corrosion resistant and they have good impact value. 14. The process involves less maintenance cost. 15. Skill of the operator does not influence the quality of spot welds obtained by this process. 16. The process is normally free from smoke and spatter. 17. There are no holes. Hence, there is no leaking or weakening of the sheet. 1. Stud welding is used in fixing fluid, air lines, wiring looms, machine guards. handles, insulation and fireproofing materials. 2. Stud welding is used for applications where access cannot be made to the reverse side of an assembly such as mounting circuit boards, rails, instruments, earth points and many different components. 3. In the automotive industry, the process is used to assemble heat shields, power steering and dashboard components, instrument panels, insulation, exhaust systems, lighting systems, brake lines, trim and electrical wire routing. 4. In the farm equipment industry, it is used to assemble fenders, brackets, cabs, spreaders, shrouding, thresher teeth, wiring and hose management parts. It is also used in lawn and garden equipment such as tractors, mowers and seeders. 5. In the construction equipment industry, it is used to make cover plates, non-skid devices and wiring and hose management parts. 6. In the commercial appliance industry, it is used in commercial dishwashers, bottle washers, cooking equipment and griddle plate assemblies. 7. Furniture manufacturers use it for metal household and office furniture, lawn furniture, shelving and racks. 8. Assemblers of fabricated metal products use arc stud welding in barbecue equipment, enclosures, plumbing apparatus, insulation enclosures, heating, ventilation and air-conditioning units, and water storage systems.